Home News Sergio Garcia Lends Support To Rory McIlroy After Similiar High-Profile Bust Up. Sergio Garcia Lends Support To Rory McIlroy After Similiar High-Profile Bust Up. 5 years ago by Bernie McGuire Comments Off on Sergio Garcia Lends Support To Rory McIlroy After Similiar High-Profile Bust Up. After being in a similar high-profile sporting split Spain’s Sergio Garcia has express a desire to comfort Rory McIlroy following a decision to end his relationship with finance Caroline Wozniacki. McIlroy shocked the golf world on the eve of this week’s European Tour flagship BMW PGA Championship at Wentworth in England by announcing he and the former World No. 1 Danish-born Wozniacki have ended a three-year relationship. The double Major winning 25-year old McIlroy was close to tears in speaking of the break-up and hours after his management company issued a statement advising of the split. Some years back Garcia was instrumental in ending his 12-month similar high-profile relationship with Swiss tennis ace, Martina Hingus but then found himself dumped in early 2009 by Morgan-Leigh Norman, the only daughter to two-time British Open winner Greg Norman. Sergio Garcia with ex-girlfriend Morgan-Leigh Norman who dumped the Spaniard in early 2009. Now Garcia, who is involved in a seemingly steady relationship with a German amateur golfer, wants to help ease McIlroy’s pain. “I haven’t seen Rory since I heard the news, but when I do I will definitely put my arm around his shoulder and ask if he wants to talk about it,” said Garcia. “I’ve been through the same sort of thing a couple of times. I broke it off when I split up with Martina (Hingis) but Morgan-Leigh was the one who left me. And of course how you react is very different. “When you are the one who leaves someone, you can usually get over it quicker. But either way it is always a hard thing to do when you have been someone for a long time, for a period of years, and shared so much together. “It should be easier if it is mutual, but when it is a really painful break up you try to get away from it by throwing yourself into golf more than ever. In fact, Garcia’s golf game went into a tailspin when Norman ended their relationship early in 2009 after the couple first began dating in 2007, and in the year the Spaniard lost out in a British Open play-off to Ireland’s Padraig Harrington at Carnoustie. Garcia became a virtual golfing recluse cutting his schedule to a bare minimum and spending more time hanging out with his beloved Castellon Football team than on the practice ranges of the world. After having won the prestigious Players Championship while dating Norman, Garcia didn’t win again to more than two years following their split. “Every case is different, but for me the hurt of the break–up was one of the reasons I felt I had to stop playing the game for a while,” he said. “Time is a great healer, but how long it takes is going to be different every time. It’s not something you can predict. “I know how I felt, but I can’t put those same feelings on someone else because you don’t know the full background. Garcia is now dating German-born amateur golfer, Katharina Boehm with the couple sealing their friendship in spectacular manner later last year when Boehm caddied for Garcia in capturing the Asian Tour’s season-ending Thailand Golf Championship in Bangkok and the 25th win of his pro career. “We all go through these difficult moments in life and things are no different for us because we are famous golfers,” Garcia added. “We are real people too, and we go through the same things. We get hurt emotionally sometimes, the same as everyone else. 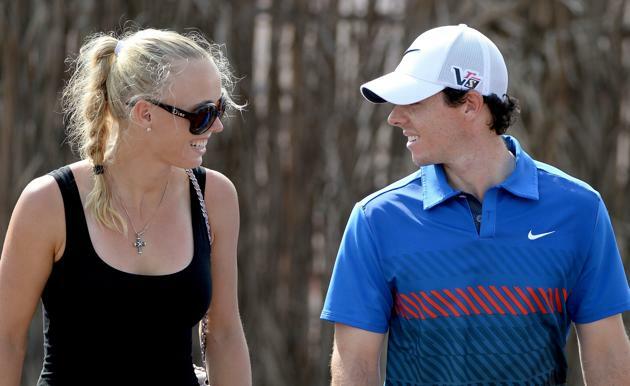 “Things do get better, and I’m sure Rory knows that. And current and fellow US Open champion Justin Rose has also expressed his sympathy over McIlroy’s announcement. “It’s unbelievable as Rory’s a friend of mine and I regard him as a close friend and he vaguely asked me what I’d be doing around the time I thought the wedding might be, so that’s a shame,” said Rose. “I’m disappointed to hear that for him, it’s very sad..
“And this week at Wentworth will be difficult for him. He’s a megastar. His personal life unfortunately is not so personal anymore because of the situation he is in. So it’s going to be a very difficult period of time for him. “He seemed to be getting some confidence going on the golf course.